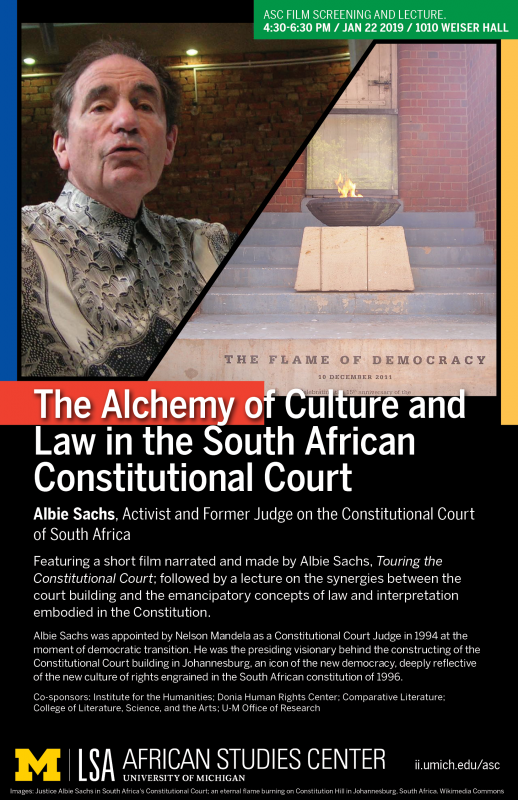 Albie Sachs, activist and former judge on the Constitutional Court of South Africa will show a short film he made called, “Touring the Constitutional Court,” featuring himself as narrator, and then speak to the synergies between the court building and the emancipatory concepts of law and interpretation embodied in the Constitution. Albie Sachs was appointed by Nelson Mandela as a Constitutional Court Judge in 1994 at the moment of democratic transition. He was the presiding visionary behind the constructing of the Constitutional Court building in Johannesburg, an icon of the new democracy, deeply reflective of the new culture of rights engrained in the South African constitution of 1996. Born in 1935, Sachs had a career as a lawyer and freedom fighter and was imprisoned multiple times in South Africa's Apartheid jails. In 1988, while working for the African National Congress in Maputo, he was nearly killed by a car bomb planted in his vehicle by the Apartheid Security Forces. 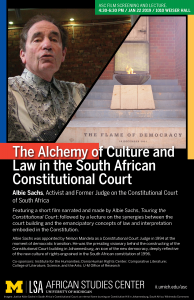 His book about these events, “Soft Vengeance of a Freedom Fighter,” won the Alan Paton literary award in 1991, an award he won a second time for his 2009 book, “The Strange Alchemy of Life and Law.” Sachs’ work as a justice of the Constitutional Court included important rulings on discrimination. He is equally celebrated for his visionary ideas about the intersection between culture and law in South Africa's democratic experiment. Recipient of 27 Honorary Degrees, Sachs lives with his family in Cape Town.